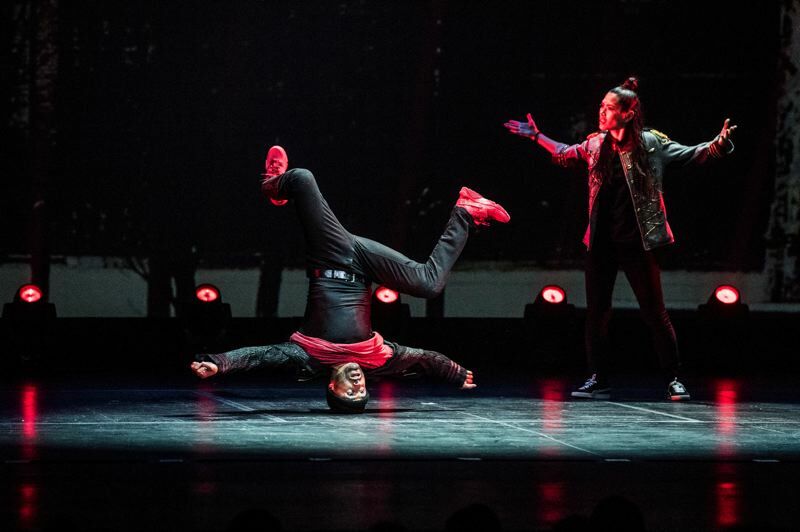 Mixing modern moves with classic story and music, "The Hip Hop Nutcracker" features rapper MC Kurtis Blow and entertains in the same vein as Broadway's "Hamilton." The contemporary dance production set to Tchaikovsky's music comes to Portland and stages at the Keller Auditorium, Tuesday and Wednesday, Nov. 13-14. Shows sold out last year at the Arlene Schnitzer Concert Hall. It's set in 1980s New York City and not 19th-century Germany. Call it a holiday show before the holidays, but it's also clearly a show that will draw young urban people, says director/choreographer Jennifer Weber. "I think of 'The Hip Hop Nutcracker' as 'The Nutcracker' for today," Weber says. "Hip hop is the current language of global youth culture — it's a language that brings so many people together and I hope that uniting people is the legacy of our generation. "I'd guess our audience is a mix of people who know and love the classical ballet version and people who have never experienced a 'Nutcracker' before. Our shows have extremely diverse audiences everywhere we go." The show is produced by the New Jersey Performing Arts Center, and it's adapted by Mike Fitelson of United Palace of Cultural Arts. Known for such hits as "The Breaks" and "Basketball," Blow, now 59, is a hip hop and rap founding father and legend. He opens the show with a short set and rap introduction. "Kurtis is like an encyclopedia of early hip hop since he was such a big part of the culture's origin," Weber says. "It's great to have that energy and knowledge influence the show and our approach to the storytelling." From the publicists: "The traditional classic Tchaikovsky score beautifully complements the power moves of these 12 dancers, with transitional and incidental music remixed and reimagined, helping to bring a beautifully surprising and contemporary vibe to the production." Just like the classic "Nutcracker" story, under a spell by the mysterious Drosselmeyer, Maria-Clara and the Nutcracker prince go back in time to when her parents first meet in a nightclub, battling a gang of mice, visiting the land of sweets and learning the lessons of the holiday season. Digital graffiti and visuals transform the landscape of E.T.A. Hoffmann's story from 19th-century Germany to the vibrant, diverse sights and sounds of a colorful and contemporary New York City (1980s Brooklyn, actually). It's staged to be on the all-inclusive holiday New Year's Eve, a time of new beginnings accentuated through the modern art form of hip hop. Says Weber, artistic director of the Brooklyn-based dance company Decadencetheatre: "It's been exciting to evolve the show over the last five years as audiences continue to come back to see the creative changes we make to the production. The dancers continue to raise the bar each year, which has taken the show to new heights." Tickets remain for the productions, 7:30 p.m. Tuesday-Wednesday, Nov. 13-14, at Keller Auditorium, 222 S.W. Clay St. Tickets are $25-$55 and available at www.portland5.com. For more on "The Hip Hop Nutcracker," see www.hiphopnutcracker.